A House Divided (ID 16000) is a country event which begins the Civil War between the USA and the secessionist Confederate States of America. 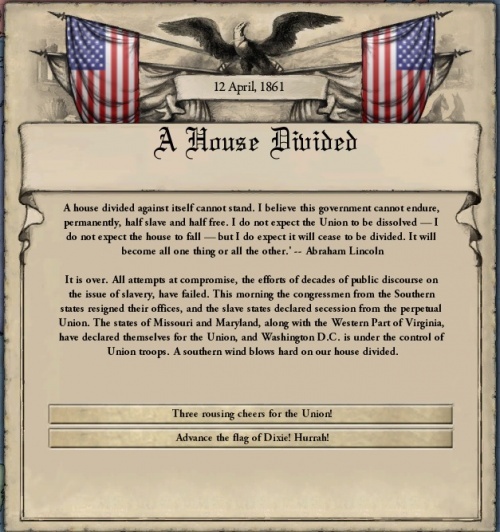 It is the culmination of many events and decisions related to the American Civil War that were added in the expansion of the same name, A House Divided. Slavery is legal in the United States. The global flag american_civil_war_has_happened, set by this event, has not been set yet. The country flag john_browns_raid, activated by the event John Brown's Last Raid, is set. The country flag dred_scott_decision, activated by Dred Scott v. Sandford, is set. The USA's upper house is at least 40% liberal. Multiplied by 20 if the year is before 1845. Multiplied by 10 if the year is before 1855. Multiplied by 5 if the year is before 1860. All POPs in the USA get -7 consciousness and -3 militancy. All CSA core provinces become part of the CSA, except for the province of Washington (the capital) any provinces in Missouri, Kansas, West Virginia, Maryland, and Delaware. The CSA's capital becomes Richmond and it gets 80 leadership points. The USA's capital switches to the province of Washington, if it wasn't already. The country flag the_slavery_debate is removed from the USA and added to the CSA. The global flag american_civil_war_has_happened is set. 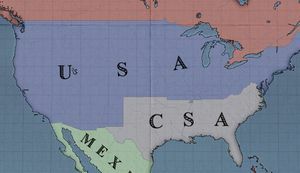 The USA declares war on the CSA with the "Civil War" casus belli, while the CSA begins with a "Status Quo" casus belli.